At the beginning of the 1935-36 season, the Football Association, at last, decided to provide its national team with a complete uniform for every match. No longer would international players have to make up the rest of the kit by appearing in assorted club shorts and socks. The shorts were navy and the socks were probably black. Uniform socks with two white stripes around the turnover, had been provided previously, and the new pairs were of this design, with the further addition of white strapping around the calf, presumably to keep the shin-pads in place. They had been worn for the first time in the previous season's fixture against Scotland. Another milestone was reached in 1937, when England wore black numbers on the backs of their shirts. It is an oft-repeated myth that this happened for the first time against Scotland, and it may have been suggested to the Scottish Football Association before the game, but their hosts, however, felt that each player's position on the field was sufficient enough to identify them and numbers were not worn in that game by either side. Unperturbed, England headed off on a tour of Scandinavia, the following month, and we believe that they wore squad numbers in each match. 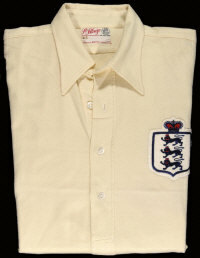 For the rest of 1937, England persisted with their numbered shirts, as did their opponents, but in 1938, Scotland, once again, resisted, with England, consequently, removing their numbers at Wembley, and also on their European tour, one made famous because they were obliged to give the Nazi salute before beating Germany, in Berlin. England were back in numbered shirts for every game of the 1938-39 season, the last before the outbreak of war. They even wore them against Scotland (who did not number their shirts until 1944), though England changed at half-time from their saturated shirts into a set of plain white un-numbered shirts borrowed from the host club, Queen's Park. The digits were back for the end-of-season tour (though, this time, probably not squad numbers) and they have been ever-present since; even for the duration of the conflict. They did dispense with the Three Lions emblem on their shirts (as they had during the First World War), but England managed to turn out in the same shorts and socks to maintain a professional image during wartime. The shirt above left was that worn by Jimmy Cunliffe on his only international appearance, against Belgium, in Brussels, in 1936. 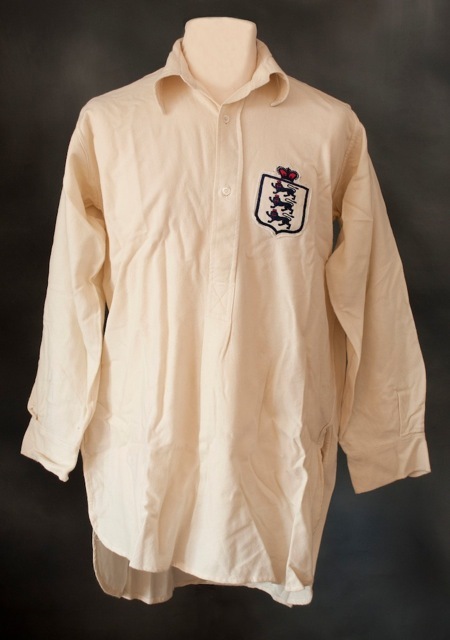 It is part of the Neville Evans Collection and we are grateful to the England Match Shirts and National Football Shirt Collection curator, Simon Shakeshaft for permission to reproduce it here. 1938-39 Please note, for this season, England wore numbers on the back of the shirts in every game. Notes England did not wear numbers in the second half against Scotland. Notes Awaiting photographic evidence, but it seems highly likely that England wore this uniform.